To apply to play as one, please [visit the forums]. Can change their physical shape and color at will, to (crudely) imitate other humanoids. Devoid of nearly all internal organs found in other humanoids, including traditional bones, save a 'brain' located in the torso. Can consume almost any organic matter that will fit within their bodies (such as dust, dirt, blood, mice, and regular food products) to gain nutrition. When shoeless, they are: able to consume dirt, dust, blood, and other debris from the floor; slip-resistant. Continuous passive regeneration of brute, burn, toxin, and oxygen damage types; can spend nutrition to regenerate lost limbs and repair their brain. Water inverts their passive regeneration when splashed, causing a build-up of toxins while they are coated. Water itself is toxic when consumed or injected, but does not halt regeneration in this manner. Damaged by all drinks or juices, due to water content. Alcohol causes noticeable toxin damage. Non-water Toxic reagents provide nutrition or low amounts of healing in high or low doses respectively, and cause less damage overall. Permeable dermal layer and decentralized internal structure renders them resistant to physical attacks, but very vulnerable to burn damage. Mostly unaffected by radiation, results in light emission. Limbs do not break as other species’ do, instead the limb severs much more easily, and becomes a splattered mess. More susceptible to temperature extremes than most other humanoids. Cannot be pre-emptively scanned for cloning. Injecting two sheets worth of phoron into the core will rejuvenate the Promethean's torso around it. They may require nutrient injections in order to begin regeneration of their limbs. Brain can be scanned into a cloning pod posthumously, in order to clone. This process is not perfect. Many chemicals are less effective on Prometheans, and some of these have serious side-effects to consider. They will be listed below for the curious or concerned. As they are new to the universe, Prometheans are not able to hold jobs as heads of staff on NT-owned installations. Kelotane: Only half as effective. Also deals brute damage. Dermaline: Slightly more effective than Kelotane, and does not deal brute damage as Kelotane does. Dylovene: Reduced effectiveness, Doses over 15 cause loss of focus / 'high' overlay. Dexalin: Prometheans don't breathe. However, doses over 15 units result in mild painkilling ability, and a small chance to collapse and repair core damage. Dexalin Plus: Stronger painkiller, higher chance to collapse and repair core damage. Cryoxadone: Severely reduced effectiveness. Causes twitching and paralysis when going into effect. Mutes the Promethean. Clonexadone: Severely reduced effectiveness. Causes seizures when going into effect. Mutes the Promethean. Oxycodone: Causes slowdown and stuttering. Synaptizine: Half as effective. Doses over 5u will kick their physical regeneration into overdrive at higher nutrition burn. Hyperzine: Causes twitching, doses over 5u will cause nutrition burning with no benefit. Alkysine: Severely reduced effectiveness. Any significant core damage being repaired will result in collapsing. Doses over 10u will result in paralysis. Peridaxon: Functions as a weak painkiller. Notable chance to confuse. Ryetalyn: Causes a 50% chance for body, 50% chance for hair, 50% chance for facial hair, to all shift toward White. Spaceacillin: Causes loss of focus in senses, an inversion of methylphenidate. Corophizine: Systemic body failure in incrementally higher doses. Causes Slime Cancer. Read as: Do not administer. Sterilizine: Causes burns and toxins. Rezadone: Causes a 50% chance for body, 50% chance for hair, 50% chance for facial hair, to all shift toward Grey. Much like their slime predecessors, all Prometheans have been observed to possess a core (or nucleus) that contains a substantial electrical charge at all times. Prometheans appear to have slight variations in their cores from individual to individual, similar to variations complicit in the cores of their slime brethren, however, the physiological significance of such variations is not currently understood. What is understood is that this core serves as the primary storage for the Promethean’s genetic information, and if removed, will cause immediate and irreparable disintegration of the surrounding body. Cloning of a Promethean's core, rather than rejuvenation through phoron-supplemented biomass production, results in a comparatively frail core, with known pathways showing damage. It is unknown how greatly this affects their future lifespan, however it is assumed to eventually cause death through neural breakdown. The epidermis is comprised of a semipermeable membrane that allows absorption of desirable materials (namely food) while keeping unwanted and/or potentially harmful elements outside of the body. Promethean “skin” is not as strong as that of other humanoids, and therefore are quite sensitive to substantial air pressure or lack thereof (in other words, they cannot survive in space). Some 'colors' of Promethean have different dermal mutations, though none are extensive. Their “skeleton” is actually a pliable, relatively dense fluid structure (referred to as a macro-cytoskeleton) that supports their body, yet is able to be reshaped at will (the process of doing so is relatively slow and laborious, however). This structure is not as resistant to sudden shock or impact as the rest of their bodily mass, and any such impact can and will cause substantial damage. Over long periods of time without material replacement, the tubes forming the skeleton will begin to become stiff, providing more structure at the cost of flexibility. Outside of these organs, the majority of a Promethean’s body mass is not well understood. Many different cells within their body appear to be capable of repurposing themselves as-needed, and this behavior is believed to be strongly correlated to their physical regenerative capabilities. Confoundingly to xenobiologists, Prometheans do not show strong evidence of possessing organs or organ systems (such as a discrete nervous, vascular, respiratory, or muscular system) retained almost universally among other humanoid species, thus throwing their classification as ‘humanoids’ at all into question by the greater scientific community. Prometheans are filter feeders, subsisting on a diet of just about any organic matter available. Probably due to their unique chemical composition, they are extremely tolerant of many substances that would be harmful or downright lethal to many other humanoids, including most alkaloid toxins. Their digestive system is exceptionally efficient, and as such are not observed to excrete waste matter. Water in small or impure quantities (Such as: within meat) is not an issue to a Promethean's biology, as it can often be safely separated from desired material. Prometheans are artificially generated lifeforms, only publically known to have been created in Xenobiology labs using highly sophisticated gene-splicing and cloning techniques. While the exact process is not a matter of public record, the process is known to involve the synthesis of terrestrial primate DNA, or the genetic material of other non-terrestrial similarly intelligent species (such as Stok, Neaera, or Farwa DNA) with that of the Aetolian giant slime or its genetically-modified cousins. A freshly created Promethean begins life as a core surrounded by a thin layer of amniotic fluid. At this stage, there are no observable distinctions from a typical gray slime core. Almost immediately, the core will begin to rapidly absorb adjacent organic material and metabolize it. Depending on the quantity of food available, gestation into a fully-formed adult can take only a few minutes to complete. While physical and rudimentary cognitive development is extremely rapid compared to most other sapient species, more advanced behaviors such as speech and complex problem solving must be learned, typically through observation and mimicry. Depending on the seed DNA used in their creation, adolescent Prometheans may adopt differing techniques to learning about their environment, but all young Prometheans display a strong affinity for mimicry as a means of learning and retaining information. Repetition and the development of consistent behavioral routines appear to be very important to Promethean development. This can unfortunately lead to strongly antisocial behaviors becoming “imprinted” on an individual, which then take substantial effort to unlearn. A Promethean is not entirely dead until their core has been irreparably damaged. If their core is intact, phororegenesis may be attempted up to ten minutes after removal from the body mass via a phoron injection of 40 unit volume. After this time, the process is still possible, however the structures believed to be responsible for memory processing and storage will begin to degrade. It is common for exceeded time-limits to result in partial-to-total loss of memory for up to 30 hours prior to the event causing structural failure. Promethean cores are, partially, compatible with NanoTrasen cloning systems. However, the process of scanning and recreating the Promethean's core is inefficient, and may result in core instability for the cloned Promethean. Instability may take the form of: core fissures, cohesion maintenance difficulty, memory loss, etcetera. Early on in their development, Prometheans may exhibit a preference for a specific body color, or “resting color”, usually heavily influenced by the color of their parent species. Prometheans are believed to possess emotional capacity roughly equivalent to other humanoids, and will often display their emotional state via their present body color. 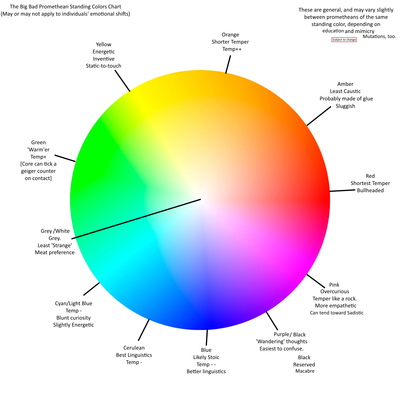 As with their physical shape, they are able to change their hue at will, although generally maintaining a color aside from one in line with their current emotional state or resting color requires continuous conscious effort. Prometheans are a nearly universally inquisitive race, often inspired by their scientist creators to learn as much as they can about their environment. They tend to have trouble grasping abstract and non-binary concepts such as philosophy; preferring to focus on the physical and practical sciences. Otherwise, an individual’s personality may be derived from the species of their “parent” slime. For example, Prometheans created using DNA from red or orange slimes (M. v. rubicundus and M. v. luteus, respectively) may be more prone to anger than those developed from pink or cyan species, whereas one generated from a black slime (M. v. ater) may tend toward a timid or reserved personality. For your convenience, here is a poorly made chart. This chart is subject to change, and can be elaborated on at request. Over time a Promethean's personality may tend to 'settle' as they emulate the world and people around them with little change. This is nowhere near a total cessation of mimicry, nor is it 'permanent'. Changes in external variables may result in dramatic shifts due to the influx of new or refreshed experiences. Even with the incredible influence others' actions have on them they do remain an individual, barring extreme circumstances, such as certain factors. Chirping, clicking, gurgling, or other acquired sounds are commonly used by Prometheans to signify lesser emotional shifts or reactions. Chirping is commonly used to signify a beneficial reaction, such as when receiving a gift. Gurgling, on the other hand, may signify a negative reaction to something, such as injury. Promethean Xenosociology is a nascent field currently dominated by speculation and controversy. Being an artificially-created species so new to the universe, Prometheans lack a unified, documented culture. Most Prometheans are isolated from their kin due to the vastness of space and scattered origins, though some (relatively small) population centers do exist — such as on their origin world of Aetolus, where roughly 1,000 individuals resided on last known census. Being able mimics, Prometheans will enthusiastically adapt aspects of other societies culture to their own purposes, and naming conventions are no exception. Prometheans are most commonly named by those involved in their creation, although the more independently-minded among them will choose a name that speaks to them on a more personal level. As a result, Prometheans do not seem to have any real consistency to their naming conventions, and as such may be found possessing very normal or very strange names indeed. Due to existing SCG regulations, Prometheans are not currently allowed to live completely independently. As such, all Prometheans must be assigned a legal guardian — typically a Xenobiologist or other trained caretaker who is responsible for the Promethean and their actions. NOTE: If the Promethean player has no other actual player to act as a ‘Entrusted Party’ and science isn’t acting as it, the case goes in the manner of a drone. The person is assumed to exist, unless antag-shenanigans dictate otherwise. If a Promethean is created in-round by Xenobiology, the Xenobiologist, Research Director, or Research Department as a whole is the responsible party for that Promethean for the duration of the round. After-round, if the Promethean's creation is canon, there is a rather large amount of paperwork involved for registering them with NT and the State, on top of any applications for becoming the sole guardian of said Promethean. The Promethean 'homeworld' of Aetolus, Vounna, is a member of the Almach Association as of 2563. As such, large amounts of information about the body's state of affairs aside from their leader, former Head of Research Naomi Harper, is unknown. While being fairly quick studies and highly enthusiastic about technology in general, there is yet to be any new or unique technology to be directly attributed to Promethean ingenuity. Due to the malleable nature of their physical bodies, Prometheans are easily able to adapt other species technology not intended for their use, such as space suits. As such, Prometheans will be able to make prodigious use of whatever technology they can get their pseudopods on. Due to the varying corrosive nature of a Promethean's internal and external fluid, many devices, tools, or clothing items require at least minor modification to be suitable for long-term uncovered use by a Promethean. Items (Worn, in most common cases) should be purely synthetic, or nearly so, to prevent accidental breakdown of organic compounds within them. Clothing articles for every-day use, and easily-stained equipment should be cleaned regularly and often. Items with sharp edges on or near areas of use (tools, tables, etc) should be rounded to prevent both damage to the dermal layer, and the catching of external material which could cause irritation to other users. Devices should have sealed seams, and as few open gaps as possible on interfaces, such as keypads, control levers, or switches, as fluid can cause damage to equipment if left uncleaned. Specialized equipment or otherwise un-modifiable equipment that is unable to be modified easily or replaced without undue cost can be safely used if the Promethean uses personal equipment such as gloves, biosuits, or fully sealed pressure suits. Due to various reasons, Prometheans may encounter minor to glaring issues with some specific pieces of equipment in-universe. Virtual Reality equipment is ineffective at interfacing with a Promethean as it would a Human. These issues result in a myriad of changes in the experience, including sensory dulling and a hastened onset of VR-sickness. Excessive use may result in possible permanent core damage as a result of its attempt to cope with the sensory issues. While comprehensive documentation on such actions has not been released to the general public by any major scientific body or interstellar government, there have been persistent rumors regarding the fringe/pseudoscience of Therianthropy, or the process of mutating a mature (read: non-embryonic) lifeform into another species. This procedure has been deemed both //extraordinarily// dangerous to the subject and highly illegal under SCG law and others. In a majority of cases, the subject will simply meet an excruciating death, and those that survive the metamorphosis will be irrevocably changed, often experiencing a range of mental complications including the perception of ‘headaches’, exaggerated emotional shifts and psychosis, and periodic bouts of short term and long term memory loss. Furthermore, the subject will face a daily struggle to simply retain their former personality and sense of selfness against a torrent of alien instincts and impulses fighting for dominance in whatever remains of their consciousness. As an artificially-created (or, as some might say, ‘uplifted’) species, formal relations with other species has not yet been established, though the general attitude given toward Prometheans is not often charitable. Humanity - The Solar Confederate Government has officially warned against the “mass production” of Prometheans, but their fundamental right to exist is protected by legislation from the early Positronic Era. They tend to be viewed with more sympathy in the technophilic Almach Rim, where several (often positronic-majority) states have offered complete personhood and citizenship. Skrell - Skrell typically view Prometheans as another extension of humanity’s tendency to create sapient species out of alien technology with little regard for the consequences. Like advanced drones, they’re viewed with suspicion and not found in Skrell space. Teshari - Similarly lacking a unified central government, Teshari have no official political stance as regards Prometheans as a species. Reactions and opinions would generally be on a pack-by-pack basis. Tajaran - Due to a lack of any form of ‘faction’ or governmental base, Tajaran governments often lack bias in either direction for Prometheans. Individuals may however have such a bias. Diona - The Dionaea view Prometheans with the same sort of detached curiosity they view most species. Vox - Vox tend to find Prometheans confounding and difficult to work with. They also find them to be delicious. This is the region of the page for various trivia collected by questions to the maintainer(s) from Players, for reference of other potential or existing Promethean characters. They don't quite fit anywhere above. When observing the different species of slime, intriguing reactions have sometimes been noted in Promethean subjects. It is unknown whether or not this is a result of working within laboratories housing these creatures, and thus somewhat knowing their nature, or due to the connection to the creatures in their genetic code. Rainbow slimes often appear, subjectively, more often the standing color of the observing Promethean. Red slimes rarely cause mild discomfort in non-matching Prometheans. Light Pink slimes often result in a feeling of 'peace', an inverse of the reaction to Red. Metal prometheans, Steel, Gold, and Silver, have slightly more resilient-to-the-touch skin, feeling more like plastic rather than rubber. Gem prometheans, Sapphire, Emerald, and Ruby, have skin which tends toward being geodesic and reflective, rather than the normal pliability. Neither mutation provides any real additional survivability, and are more rare than their standard-colored kin, while generally falling into the same personality trends as them. Prometheans will often avoid high velocities, unless their bodies are mostly sealed within some form of container, due to the 'Water Balloon' effect. The loss of locomotive control and speech slurring resulting from ingestion of alcohol is not the result of impaired brain function, rather the degrading of the Promethean's ability to control its skeletal structure for movement. This can result in varying degrees of panic similar to that experienced by a human were their limbs to suddenly become numb, but mobile. The nature of 'distanced guardianship', or when a Promethean does not live directly with their Guardian for some reason or another. This is a legal grey-area that exists due to the nature of Nanotrasen as its own entity, as well as each individual research station's differing needs. As long as the Guardian has supervision of, and the ability to react due to changes in, the Promethean's 'Home', the requirement for contact with a Promethean's specific Guardian rather than an agent thereof is diminished, past a certain age. The requirements are, however, strict enough that this commonly only applies to a larger estate, ship, or area operated by a Guardian-owned AI of class B or higher. They may not live outside the same system as their Guardian, due to response limitations of FTL travel. Due to the inability for Promethean bodies to hold human adornments such as tattoos, piercings, or similar, some Prometheans opt to embed glitter, dyes, and other small objects in their dermal or internal layers. These effects do not often last long due to the corrosive nature of their bodies, however the availability and low cost of these materials makes them viable options for attempts at copying 'fashion'. Commonly, a Promethean weighs between 75 to 100 pounds, with exceptions depending on external stimuli. Depressive chemicals, such as alcohol, have the tendency to reduce the motor control of Prometheans, resulting in a similar speech slurring as to humans, due to a loss of motor function rather than a loss of mental acuity. Difficulty maintaining cohesion, 'muting' of bodily and perceived colors, and difficulty hearing are also common. Stimulants, however, may cause an increase in the motor functions resulting in 'stuttering', vibration, phantom stimuli, or a larger influence of the individual's standing color upon their personality, among other effects. Prometheans receive their wages similarly to a joint account, though guardians of a Promethean may only use their funds for the purposes of educating, housing, or otherwise aiding the Promethean. If a Promethean is under NanoTrasen's guardianship, part of their wages will be used to pay for amenities and housing costs. Housing aboard NanoTrasen colonies is discounted for Prometheans under NanoTrasen or NanoTrasen Research Staffing guardianship. 2488 - Katai-1 set up as a Grayson Manufactories mining site. Waystation planned. 2498 - Waystation set up in orbit of Kataigal under authority of the SCG, serving as a refueling point and rest stop, under the name SGWP Deliah. 2509 - Small colony station founded by Nanotrasen in orbit of Katai-2, due to the founding of Deliah. Serves as a ‘home away from home’ for some begrudging Grayson employees. 2515 - Aetolus considered for colonization. Aether Atmospherics sets up an outpost on the planet’s surface for atmospheric filtration, in preparation. 2522 - Aether facility mothballed due to loss of interest, after multiple small habitats are constructed nearby. 2524 - Near-abandoned Aether facility acquired by Nanotrasen. Repurposing begins. Colonial-Timeline Diverges here for readability. 2531 - Repurposed Aether facility dubbed Nanotrasen Mining and Observation Point (NMOP) Sisyphus. 2534 - Nanotrasen Research Station Prometheus constructed in orbit of Aetolus, as a sister station to NMOP Sisyphus. 2534 - NMOP Sisyphus employees discover the original ‘slime’ specimen. Singular subject returned to the Prometheus for testing. 2535 - Specimen duplicated, with a degree of ease surprising to the station’s research team. 2535 - One specimen found missing from containment. Later found in the station’s chemical storage. 2536 - Previously lost and reclaimed specimen ‘evolves’, forming the first form of ‘Grey slime’. Rate of growth far exceeded the creatures found on the planet’s surface. Other specimens terminated. 2537 - Attempts made to fully sequence the creature’s genetic structure fail. Only noted to seem to be some form of thickened triple-helix structure, as opposed to a double-helix in most other forms of life. 2537 - Another specimen escapes, once more found within the chemical storage module. Phoron exposure evident. 2538 - Phoron-exposed ‘slime’ mutates, one of the offspring somehow managing to produce the compound in miniscule amounts within their core. 2539 - ‘Grey slime’ cores are acquired by SCG researchers from the unknowingly stolen package, and distributed among other smaller research facilities. 2539 - Nanotrasen mourns the loss of the ability to fully monopolize the ‘Slimes’, further distributing them among its own research stations, due to ease of care and low maintenance. However, the exact means of their mutation remains a Nanotrasen holding, allowing them to continue trying to exploit them. 2540 - First Promethean created by accident in a lab aboard the NRS Prometheus. Dubbed ‘Pr[r]-1’. 2540 - After the first Promethean was created,the lab’s Director self-assigned themselves to the study of the being. 2540 - Second ‘Natural’ Promethean (Pr[g]-2) created after nearly a year is spent attempting to analyze the fluid seemingly responsible. The exact mechanism of biomass transformation is not able to be determined, however the formation and rapid gestation of some form of hybrid fetal core is assumed. 2542 - Pr-1 and Pr-2 moved into separate containment after Pr-1 attempts to breach its own. 2543 - Pr-1 and Pr-2 show signs of rapid mental development, and are given various tests to assess their degree of intelligence. 2544 - Pr-1 and Pr-2 continue their tests, however with the pushing of the head scientist, tests are shifted to include basic morality tests. Tests suggest non-primal morality concepts in the two subjects. 2544 - The NRS Prometheus’ Director, Dr. Naomi Harper, with the backing of the other head scientists, petition for recognition of Pr-1 and Pr-2 as fully sapient beings to the local state, under the name ‘Prometheans’ in respect to the station they were created on. 2546 - Nanotrasen is permitted to authorize the creation of Prometheans within its laboratories, under the requirement of strict documentation and care that newly created forms are not a threat at large. Commonly restricted to aiding and working in the facilities that create them in-lab, in base maintenance, and in civilian work. 2526 - Habitats previously constructed by Aether are purchased by multiple smaller parties, including a sizable internal fraction of positronics, with the intent of colonization. 2528 - Small colony set up within the habitats. Aether Atmos once more requested to aid in the efforts. 2529 - Habitats expanded. Planetary governmental framework beginning. 2529 - Official colony name, ‘Aetoran’, established, marking the start of the colony’s official history. 2531 - Aetoran’s economic base leans toward agrarian, in agreement with Nanotrasen’s previous mining rights. Mining operations continue. 2537 - Colony publicly supports a majority agreement with the SEO, due to Nanotrasen influence. 2541 - Morpheus Cyberkinetics joins the SEO board of directors. Aetoran support pushes further toward the SEO, however minor. 2540 - Pr-1 specimen is created aboard the NRS Prometheus. 2544 - Aetoran authorities contacted by the NRS Prometheus’ onsite Director regarding the petition of sapience recognition for Pr-1 and Pr-2 as a new species. 2544 - Legal discussion between the Aetoran government and the local Nanotrasen stations ends after a full year, resulting in the Aetoran government agreeing to consider them ‘persons’ akin to their population of higher A-class drones. 2545 - A-class drone population increases due to lightened EIO regulations the year prior. 2545 - Aetoran authorities discuss the prior year’s occurrences with the SGWP Deliah’s officials. More subjects created within other divisions of the NRS Prometheus, following the same Pr-# designation scheme. 2546 - In light of their synthetic creation the creatures, now officially dubbed ‘Prometheans’, are held by Sol under similar restrictions as early positronics and drones are, under the EIO. While not classifiable under the drone nomenclature, they are still believed to be a threat in the event of rapid genesis, and require observation and yearly checks. 2547 - Nanotrasen is permitted to authorize the creation of Prometheans within its laboratories, under the requirement of strict documentation and care that newly created forms are not a threat at large. 2562 (2-03/11) - Naomi Harper stages a coup on Aetolus utilizing Promethean subjects, later to declare Vounna independant. 2562 (2-23) - The Almach Association forms following the declaration of the Aetolian Council. 2562 (5-25) - Harper's Aetolus maintains a heavy curtain on information on the operation of the Vounna system, despite the loosening of the cordon. Rumors of attempts to create a more powerful strain of Promethean / "Aeoto-Promethean" / "Aetothean" form, though none are believed to be active outside the Association.